Yma Sumac’s career embodied many of the contradictions that emerge when the international desire to consume exoticism clashes with the realities of traditional or indigenous cultures. Born high in the Peruvian Andes, a descendant of the last of the Incan Kings, Yma Sumac spent her childhood literally ‘talking’ with the birds, the beasts, the winds, the sound of life and nature surrounding the little village of Ichocan. While still a small girl she began taking part in the religious services of the sun-worshipping Indians and became almost deified by them. Word of her phenomenal vocal powers reached Lima, the Peruvian capital, and an official government delegation traveled into this remote mountain region to see and hear what they secretly believed to be a myth. 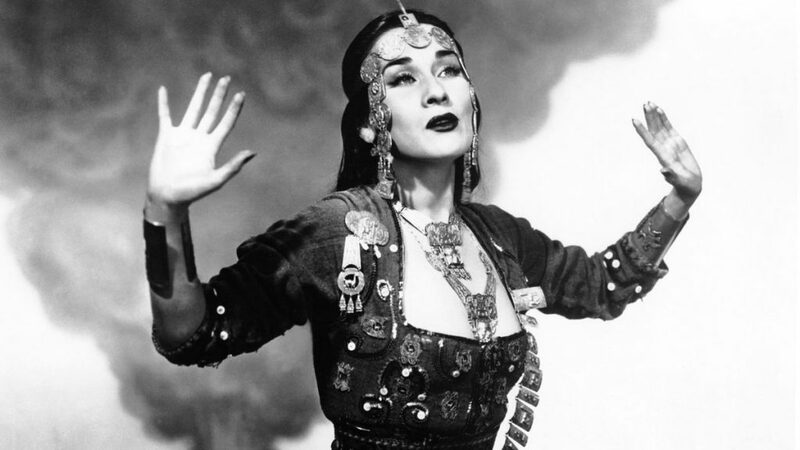 Yma Sumac, the Peruvian singer, startled audiences in the United States and Europe with her remarkable voice, beauty, and mysterious “Inca” princess/priestess persona. Accounts of Sumac’s life—like the largely fictional narrative quoted above—are full of fantasy and contradictions. Nevertheless, this piece begins with yet another story about her discovery: a true one. Zoila Augusta Chavarri del Castillo (Yma Sumac) and Zoila Rosa Beoutis Joffré (my mother) were close friends during their sophomore and junior years in high school. These two young women had traveled from the highland provinces of Cajamarca and Junín to the capital city of Lima, seeking access to better schooling than what had been available back home. While the nun-run school they attended was hardly elite, it does suggest that their families had socioeconomic resources not available to the great majority of highlanders. The two friends used to study in the house of my great-uncle, Alejandro Beoutis Santiváñez, who hosted my mother in Lima. Beoutis was an avid promoter of the Andean traditions of his homeland, and his house was a place of meetings for rehearsals and preparation for participating in folkloric events. He sponsored many highland artists who lacked economic resources, so they could participate in the effervescent scene of folkloric performance in Lima. By the first few decades of the twentieth century, rural highlanders had started to migrate in great numbers to the cities, especially Lima, and their increasing presence began to be reflected in the contests, religious festivals, and other cultural elements they brought with them. While my mother’s cousin Hélida was rehearsing for one such event in 1938, Zoila Augusta and my mother decided to spy on the proceedings. My aunt was rehearsing with a well-known folkloric musician who was from the highland department of Ayacucho: Moisés Vivanco de Allende. This musician heard Zoila Augusta humming and echoing the songs and called her saying, “young woman, you have a splendid voice.” Zoila Augusta ended up singing in a duet with my aunt for the upcoming occasion and from then on Vivanco became her manager and artistic mentor. He married her in 1942. Later, Vivanco would romanticize this ‘discovery’ story, claiming that he had discovered her in her native Cajamarca. This led to further fantastic reconstructions, such as the claim that when the government decided to take Zoila Augusta to Lima it was “a decision that almost caused an uprising among some thirty thousand Indians over the loss of their revered ritual singer.” Such exaggerations began to cause resentment among some Peruvian highland audiences toward the star and her manager-husband. Zoila Augusta’s folkloric singing career started right away, whereas my mother returned to Junín for her senior year of high school. Their friendship ended after Yma’s ‘discovery.’ They would meet again in 1957 and 2006. By 1942, Zoila Augusta would start using as her artistic name Yma Sumac (most commonly spelled in Peru Ima Sumac), symbolically marking her new identity as an Inca princess/priestess. In Quechua this name means “how beautiful” and became associated with Inca royalty via the popular theatrical piece Ollantay, believed at the time to be a legacy of the Inca period. Typically, if someone in the U.S. has heard of Peru, it is in relation to the Incas and Machu Picchu, the archaeological site added to the list of the New Seven Wonders of the World in 2007. While most Peruvians proudly claim Machu Picchu and the accomplishments of the Inca Empire as their heritage, they are more hesitant to envision Peru as an Andean nation with highland people and culture at its core. Unlike other Andean nations such as Bolivia and Ecuador, whose capitals lie at the heart of the Andes, Lima straddles the coast. This dichotomy between the coastal center of political and economic power and the peripheral or marginalized highland regions has marked Peruvian history since the colonial period (1535-1821) and has become even more prominent since independence. Since the 1960s, the Peruvian nation has in most international forums presented itself as a criollo (creole) culture, a culture that developed on the coast mixing mostly Spanish and Afro-Peruvian elements. However, during most of the first half of the twentieth century, this national identity was still in flux. Nationalistic, populist governments, especially those of president Augusto B. Leguía (1908-1912, 1919-1925, 1925-1929, 1929-1930), sought to pin down and project a stable national identity. In this context, highland regional movements attempted to establish a more ‘authentic’ highland cultural identity. Effervescent artistic production played a key role in these movements, operating in an internationally validated arena that had come to be known as ‘folklore.’ Previously-scorned indigenous and indigenous-based music and dances began to be seen as something to be protected and encouraged. During the first part of the twentieth century, the highland department of Cuzco took a leading role in questioning el centralismo limeño (Lima centralism) and in arguing that the heart and identity of the nation should be in the Andes. Cuzco artists and intellectuals had a special advantage: in addition to being the cradle of the Inca Empire, Cuzco was also the gateway to the monumental site of Machu Picchu, unveiled to the world in 1911. The so-called “scientific discovery” of Machu Picchu initiated a new epoch in the role of Cuzco and the indigenous Andes in the Peruvian and international imaginaire. Although the site is mentioned in eighteenth- and nineteenth- century documents, and was known to the people living in the area, to a great extent it was due to the efforts of two American citizens, Hiram Bingham and Albert Giesecke, that Machu Picchu became a major focus of national and international interest. However, it was not until the 1940s, with the construction of the first tourist hotel in Cuzco, regular commercial flights coming into the region, and the construction of a zigzagging road up to the site that significant numbers of tourists began traveling to Cuzco and Machu Picchu. From the 1920s on, it is obvious that not only Cuzco but most folkloric music and dance adopted the “Inca” identity in order to be validated. New spaces at the national and regional levels were created to promote this kind of art and Cuzco artists acquired a prominent place in them. It was in this context that Yma Sumac began her career. She joined the “Folkloric Art” group led by Moisés Vivanco and in 1942 made her debut in national and international radio. Soon the company would change its name to “Imma Sumack and the Peruvian Folkloric Ensemble,” a clear sign of the rising fame of the young star. In the years that followed, the ensemble toured Peru, Chile, Argentina, Brazil, and also Mexico, probably the most important artistic center of Latin America. By then, Mexico was the leader in music, television, and movie production for all of Latin America; to be recognized there meant great fame for artists of the time. Because the tour to Mexico represented an important challenge for the singer and the group, they made sure to gather the best artists from around Peru. They invited three well-known popular musicians from Cuzco to form part of the ensemble. This initiative was ill-fated: after playing with the ensemble in Lima, the flute player was run over by a car and another could not travel because of visa issues. The original amicable relationship between Yma and Cuzco artists would weaken when she left behind traditional Andean folklore in exchange for a persona that sold best abroad. Yma’s voice was indeed extraordinary. While some say that her voice range was of four octaves, others, including the singer herself, asserted that it reached five. It seems, though, that what impressed audiences the most were the extremely high notes that she could reach. While traditional indigenous Andean female singers are known for their very high-pitched voice, there is no doubt that Yma Sumac’s name in Peru became synonymous with high-pitched singing. However, her singing would move far away from the traditional folkloric Andean style and toward a quasi-operatic style. Yma signaled this shift by wearing expensive gowns and adorning herself with Peruvian jewelry. because of her distinct musical individuality, but also because of the absurdly bombastic initial American publicity and promotion—which billed the singer as an Incan priestess and/or princess and relentlessly emphasized and even overstated her vocal extensions—Yma Sumac was almost never taken seriously as an artist. Instead, she was relegated to the ranks of curiosity entertainers, a freak performer…[A]n isolated figure in the annals of performing, Sumac has always had mystery surrounding her. She was as exotic to American culture as she was glamorous. This mysterious oddity fit perfectly within the script of the first Hollywood film featuring Yma: Secret of the Incas, the movie that inspired the Indiana Jones films. Yma’s role in the film was directly related to the Inca royal persona she had adopted. Like the exotica musical movement, Hollywood’s representations of exotic countries, and/or cultures embodied by artists and archaeological sites were readily consumed by the U.S. public. This was the time when, for example, Carmen Miranda came to embody not only Brazilian identity but a generic “Latin” identity. Secret of the Incas was shot in 1953 and premiered in 1954. Albert Giesecke, one of the two Americans who played a key role in the “discovery” of Machu Picchu became a key person who facilitated local help and guidance to the filming crews. While there seems to have been a remote link to Inca ancestry through Yma’s mother who bore Atahualpa (the name of the last reigning Inca in Peru) as one of her maiden names, this was greatly exaggerated in marketing the film in the U.S. In Secret of the Incas Yma was portrayed as a local elite near Machu Picchu who acted as an intermediary between the animistic, superstitious, and primitive Indians in the film and the scientists and officials who were working at archaeological sites. Her character is also a sort of priestess, making an offering to an Inca mummy found in the site. Remarkably, Yma Sumac, was never in Machu Picchu—or, indeed, even in Peru— during filming. The songs were pre-recorded, and she filmed her scenes on Hollywood soundstages. This music is credited in the movie and in all of her recordings to Moisés Vivanco. Any direct input into what she was supposed to perform was either not credited or put aside in favor of what worked for Vivanco or for the producers. Featuring Yma in the film was a clear strategy to make this movie more marketable. The central theme and the main musical performances are interpreted by Yma, and they already display the modifications made to her art to fit the exotica movement. Her music sounded nothing like indigenous or mestizo traditional music of the Peruvian Andes. In fact, it seems like the filmmakers did not want to record any of the real sounds made by the indigenous peoples when they entered the scenes with their ritual horns, music, or dance. Those sounds were dubbed with an orchestrated mixture of Afro-Caribbean and other popular exotic sounds. The Indians were portrayed as an admiring crowd gathered around Yma Sumac, in accordance with exaggerations about the purported deification of Yma by the Indians in her hometown. All this despite the fact that Yma and the Indians on site in Machu Picchu were filmed thousands of miles apart. While the movie was a great economic success for Paramount Studios, it was harshly criticized in Peru by highland artists and intellectuals, especially those from Cuzco. While they recognized that Machu Picchu’s international exposure would benefit tourism, they were outraged at how the music distorted their heritage. After all, they had been trying for decades to perfect this art—to put it at the center of Peruvian national identity and win international repute. They argued that there was no need to insert faux-exotic pre-recorded music given the rich musical traditions available locally. The film’s portrayal of Yma increased the preexisting tensions between Peruvian folkloric artists on the one hand and Moisés and Yma on the other. In 1957, after a scandal involving an affair and a lawsuit, Yma divorced Vivanco and went back to Peru for a short visit. She had been hired to perform by a North American Oil company in the northern coastal town of Talara. Coincidentally, my family had been relocated to Talara due to my father’s military career. My mother went to see her perform, but she did not approach her, thinking that Yma would not remember their childhood friendship. But Yma saw her and recognized her and they hugged. My mother told Yma that she had chosen Emperatriz (one of Yma’s middle names) for a middle name for her daughter. I was born in Talara three years after this encounter. My mother gave me, her youngest, the first name she shared with the star: Zoila. Yma Sumac’s career would take several turns in the U.S. and Europe before she passed away in 2008. By then she had sparked the fancy of many audiences, especially in the U.S., where a legend was created about her “really” being Amy Camus (her name spelled backwards), a bored housewife from Brooking and not an Inca princess/priestess. After her bittersweet visit in 1959, Yma did not go back to Peru much until the 1970s, when she had another difficult encounter with the Peruvian public, this time in her homeland of Cajamarca. She had divorced Vivanco for the second and last time in 1965 and this seems to have given her more freedom to spend time in her own country. Her visits in the 1970s were controversial owing to what the public perceived as her haughtiness and what she perceived as a lack of appreciation of her accomplishments. Her final visit was in 2006 when, thanks to a campaign run by a fan, she received a series of honors. She finally received a sincere recognition in her own country after a long-standing tense relationship. At the time she seemed frail and did not carry out formal performances. She did sing briefly with a Peruvian group on the train while on her way to visit Machu Picchu one last time. Needless to say, this belated recognition moved Sumac deeply. It was during this trip that she stopped by my mother’s house in Lima and during a very short visit she told her, “I want to hug you and give you a kiss like when we were girls.” Perhaps anticipating that it was going to be her last visit to Peru, Zoila Augusta wanted to retrace some of her important steps and see the dear friend from her youth. Many of us Peruvians, especially those of us from the highlands or of highland descent, believe that before departing for good, a person or his/her soul, needs to retrace the important steps that were taken during life. Yma Sumac had wanted to reconnect with Peru. 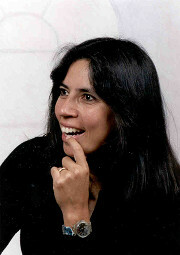 In her final decades, Yma included more songs in her repertoire that had roots in Peruvian folklore (as is shown in the “Andean Lullaby” she sang in a 1991 television interview in Germany). Yma Sumac’s career embodied many of the contradictions that emerge when the international desire to consume exoticism clashes with the realities of traditional or indigenous cultures. Yma was not allowed by her manager-husband and the recording and movie industries to develop the art that led her to popularity at home and in Latin America in the first place. It is hard to know how much she was complicit in the transformation of her art into the oddity that it became, but we know for sure that it was very important for her to be recognized back at home. It was fortunate that this desire was fulfilled at the very end of her life. Part of this story appeared in one of Peru’s main newspapers when Yma Sumac passed in 2008 (Variedades, El Peruano, November 10, 2008, 3-4). As Yma’s main biographer states, in 1950, when Ima’s first album in the U.S. was released, the horrors of World War II “were still fresh in the minds of the world’s people [and they] were ready for diversion … [T]his led to the growth of an unusual movement in American popular entertainment called ‘exotica’” (Limansky, 3). This was signaled by a testimony that her biographer gathered and that stated that in any important appearances after this honor, she wanted to wear all six heavy medals that she had received in Peru (Limansky, 248). Christopher Heaney, Cradle of Gold: The Story of Hiram Bingham, a Real-Life Indiana Jones and the Search for Machu Picchu (New York: Palgrave Macmillan, 2010). El Comercio, August 18, 1959, 3. Nicholas Limansky, Yma Sumac, The Art Behind the Legend (New York: YBK Publishers, 2008) p. 11. Zoila Mendoza, Creating Our Own: Folkore, Performance and Identity in Cuzco, Peru (Durham and London: Duke University Press, 2008). This entry was posted in Uncategorized and tagged Anthropology, History, Inca, Yma Sumac. Bookmark the permalink.